Duke Tumatoe has successfully proven that age is just a number! Duke has made a career out of class acts involving different genres of music such as R&B, rock, blues, and funk and humor and had a regular gig on the nationally syndicated “Bob and Tom” radio program. Being southerner from Chicago, Duke hung out with several legends and was a huge fan of blues music. Did you know that Tumatoe founded, what would end up being the band known as REO Speedwagon? Even though his stint with the band wasn’t very long, it didn’t slow him down because he founded the Duke Tumatoe & the All-Star Frogs, which toured extensively for more than a decade in the Midwest. They hit a number of college campuses and bars as well. Even though the schedule was hectic and left the band members with little time to record albums, they released a couple of them – Red Pepper Hot! and Back to Chicago. After a while, Tumatoe had had enough! He wanted to take it easy, which led to the band splitting up. This was the foundation for the Power Trio, responsible for Duke’s Up for Blind Pig Records. 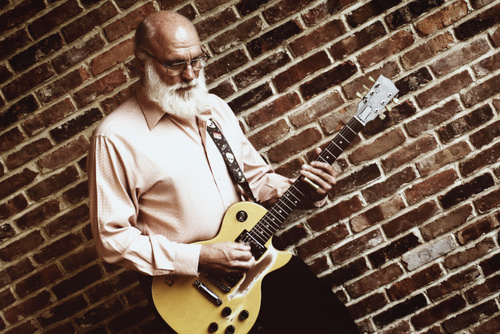 He created his own label known as the Sweetfinger Music, and released several albums – Dr. Duke, Wild Animals, Greatest Hits Plus, and the all-instrumental Picks & Sticks. He also opened for many legendary figures in blues and rock, during his long career. Those names include Muddy Waters, Buddy Guy, B.B. King, George Thorogood, Fabulous Thunderbirds, Doobie Brothers and John Fogerty. Despite his age, Duke refuses to slow down and still performs hundreds of shows regularly. His creation “You’ve Got the Problem!” garnered a lot of praise when was released. The Power Trio truly worked magic when it came to displaying their talent for playing instruments, which presented a thrilling picture when combined with tongue-in-cheek humor. The sob story of a poor, misunderstood person and his struggle against the world, with his partner accompanying him, struck a right chord with the audience. Duke’s musical mayhem was well-accepted and is considered to be one of the best live performances to date. Tumatoe is one of the most lucrative hidden treasures of music, and fans want him to maintain the mantle. His shows are exciting and unpredictable – you never know what to expect. Sounds great right? Get your tickets now, or “you have got a problem”. Visit Eventsfy.com to Connect with Duke Tumatoe. Follow him on facebook, twitter, youtube and more!